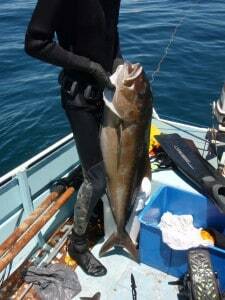 Spearfishing is a sport that I have only gotten into in the last few years. I have always had a passion for fishing, but found it to be incredibly tiresome when you weren’t catching anything. On top of that, it is often expensive when you add rods, reels, lures, plastics, bait, line and other little bits and pieces together. The worst thing is that it can break or wear out, and the only thing that you can do is replace it. Bait is a huge cost if you don’t catch anything, but it can sure be worth it if you do. 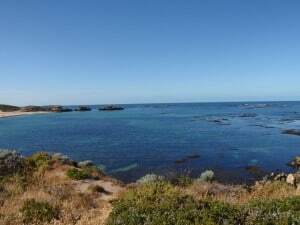 I was handed a gidgee at Wagoe, near Kalbarri when we went diving off the rocks a year or so ago. The next few hours that followed were immense fun; shooting smaller sized fish and trying to hit the big ones. The problem with a gidgee is that anything over about 40cm is too hard to shoot. You can of course upgrade rubbers so that it fires further, but I was looking at bigger ammunition! My brother had a cheap 50 dollar speargun in the shed, which was never used. I decided to take it out one day and give it a go. I loved it, even though it didn’t fire very far and often got tangled. It also didn’t shoot very straight either! Soon after I purchased a new Orca speargun (a South African gun) which is about 180cm tall, from the end to the tip of the spear. It has a rubber which is much more powerful, and a much better reach. I was amazed at how far it would fire, and how fast. After going out at least once a month for a while, the mono line broke, and I replaced it with some wire, but made it much longer. It now has a reach of about 6 metres, and I put another rubber on it too. The reason for the extra rubber is just to get the spear some more momentum. Up until then, I could shoot anything up to about 10kg, but any bigger and you risked not putting the spear through the fish. This often meant you would wound the fish and not be able to take it home either. With a new rubber and longer wire, the spear now fires quite quickly, and is able to go through some larger fish. I still haven’t purchased a reel or float line, but I would imagine this will happen in the near future. The best thing about spearfishing is that if there are fish around, you have a much better chance of getting them than plain fishing. I can jump in the water where a few fish are and have a feed in less than 20 minutes, whereas when you are fishing you could take hours to get that. On top of this, you get to choose what you catch. If you don’t want to shoot them, then you don’t have to! 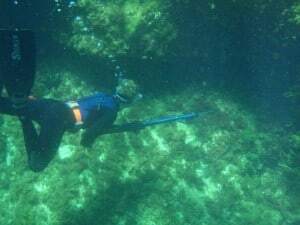 Spearfishing involves using a gun which is either air powered or elastic powered. Spears range from under a metre long to even over two metres. The idea behind spearfishing is that you dive down into the water, find a fish and shoot it. If you are a good shot then you might be able to kill the fish instantly. If not, you need to use a knife to kill them. Air powered spearguns are pumped to build up pressure, and are usually very small. They are best used for smaller fish or in areas where there are small caves and shallow water. They are agile and easy to work, but I haven’t had much experience with them. These are much longer, and generally more powerful. The idea is that a spear takes off along a rail, to ensure that it fires in a straight line. The longer the gun, the less chance of the spear going to one side or going up or down. You can choose the length of the monoline or wire to fire as long as you want. Basically it gets wrapped lengthways on the gun once, and then more if you need it to. Bear in mind though, that if you don’t have a very powerful gun then lengthening the rope is useless. If you do a lot of shallow water shooting, then having the extra length can be a pain as it takes longer to re load and is much easier to tangle! Most spearfishing is done by free diving, which basically refers to diving without tanks or another oxygen source. In many places of the world, you are not allowed to go spearfishing with a tank, because it makes it too easy to get fish, and then a problem for overfishing. As a result, people practice holding their breath and with good training a diver can reach 35 metres with ease. When you consider how deep this really is, it’s an amazing feat. There are a number of risks associated with free diving, but if you are careful, don’t push your limits and always dive with a buddy you reduce this by a lot. Generally if you are diving in deeper water you go by the rule 1 down 1 up. What this means is that one person stays on the surface and watch the person diving down, to ensure that every person stays safe. Shallow water blackouts are common with free divers, and more common amongst those that are more experienced. It is a lot of fun to go free diving, but you need to learn how to equalize properly, hold your breath safely and use the right techniques to ensure you stay safe! Where can I go spearfishing? 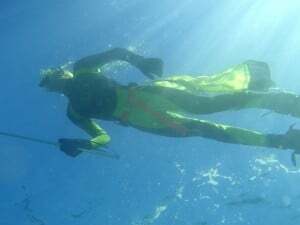 Spearfishing is a popular sport throughout the world. 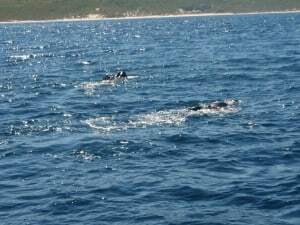 Every area has different laws which apply to divers shooting fish. 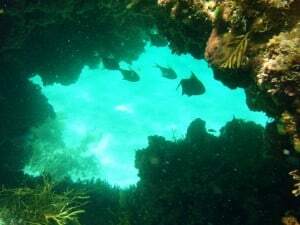 In Australia, there are many marine parks which forbid spearfishing, and some permit it without compressed air. There are a lot of different laws, so be sure to find them out before you go. 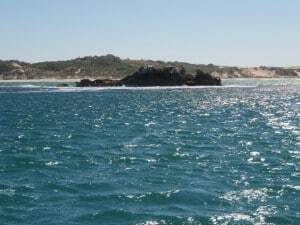 These include the areas that you are allowed to go spearfishing, the types of fish that you can shoot, the number of fish that you are allowed to take and various other little bits and pieces. Basic snorkelling gear and a gun! What do I need for spearfishing? 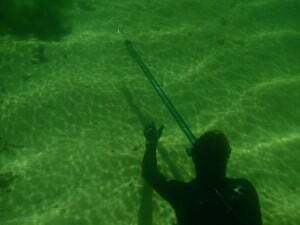 Spearfishing can be done with basic snorkelling gear, and a speargun. A knife is also handy when you need to kill the fish that you have shot. Spearguns range from small air guns through to massive rail guns for taking out fish over a hundred kilos. A wetsuit is important to keep you warm, along with some good fins, a mask and snorkel. Spearfishing gear varies slightly from normal snorkelling gear, because it is designed for diving in deeper water. The wetsuits have a special pad in the middle of the chest to help load the guns, the fins are much longer and designed with better flex so that you use as little energy as possible to go a certain distance, masks are slightly smaller to make equalizing at low pressures easier and quicker and a knife is an addition too. On top of these things, if you are going for larger fish (above 15kg or so) you need to have a reel or float. A reel bolts onto the gun and acts similar to a fishing reel. When you fire, the reel unravels for as long as the rope is. This is especially handy if you catch a big fish, because you can allow it to run until its tired, wind it in a bit and play it. 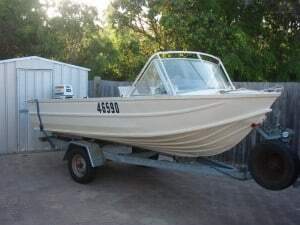 Without a reel, you would get towed along. If it’s a big fish, then you would struggle to get to the surface for a breath, and you are putting immense force on the rope and spear itself. A reel is used more primarily when you are diving from a boat, as it is small and easy to use. The other option for shooting larger fish is a float line. This is basically a tough balloon with a diving flag on it, which is attached to 20 – 40 metres of rope and then onto your rope. When you shoot a big fish, you simply let go of the gun and then follow the float. The float is also used for putting fish onto it. When you shoot something, you thread it onto the rope and let it drift back, behind you. This means that if a shark comes around it will eat the fish which is 20 metres behind you rather than attacking you! When shooting huge fish, often the spear will be attached to the float, not the gun. Bigger fish may require several floats, as they will simply pull a small float underwater, and you will lose all of your equipment. 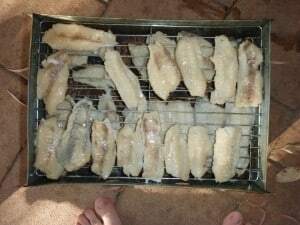 Smoking some fish from a few hours work. Why is spearfishing so much fun? Spearfishing ranks in the top three of my favourite sports. It is a lot more exciting than fishing, and usually a lot better pay off too! On top of that, it costs so much less. Once you own a gun, all you need to replace is the spears if you ever bend or lose one (very rarely), new rubbers (rarely) and new lines/float/reels when they wear out. Compared to the fishing, it’s a much cheaper sport, and you will more than often score better fish too. There is something exhilarating about diving down, holding your breath and making the perfect shot. Not to mention the amazing fish that you can shoot, and the great cooking that you can do with them! Spearfishing can be a dangerous sport, if you get hurt, black out or make silly mistakes. The risk of shark attacks goes up a little bit, but if you keep the fish well away from you, kill them quickly and get them out of the water as fast as possible, you are still fairly safe. Of course, be careful with sharks, but in most cases the shark is more interested in real fish, than humans swimming around. If you haven’t ever given this great sport a chance, you should!